Friday at morning Mass in the Casa Santa Marta. 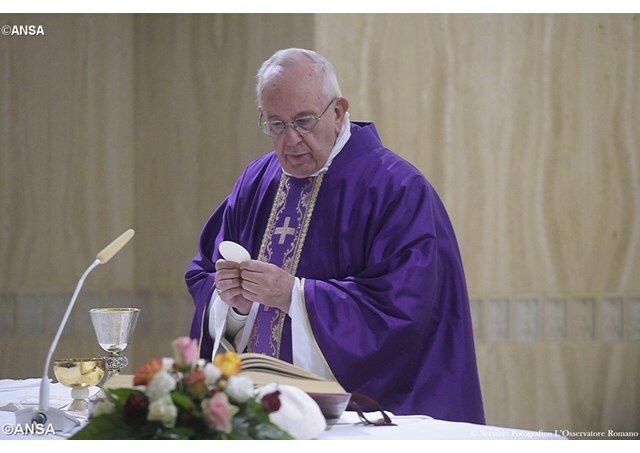 Fasting, the Pope said, is a little like “stripping oneself” of pride. He said that to thank the Lord and at the same time despise your labourers that are forced to fast because they do not have enough to eat is inconsistent and unchristian. Inviting those present to perform penance in peace, he said “you cannot talk to God on the one hand and to the devil on the other”. He invited the faithful to fast in order “to help others. But always with a smile”. Fasting, he said, also involves lowering oneself by reflecting on one’s sins and asking forgiveness from the Lord. Reiterating that he has never forgotten that shameful episode, Pope Francis urged the faithful to ask themselves whether they treat their domestic workers with fairness, whether they treat them “as people or as slaves”, whether they are paid a just salary and have the right to holidays and are recognized in their human dignity. Pope Francis went on to tell another story stemming from personal experience. He said that once, when speaking to a very cultured gentleman who was known to exploit his domestic workers, he explained to him that this is a serious sin because we are all created in the image of God. And referring again to the First Reading that tells us “to share our bread with the hungry, shelter the oppressed and the homeless, clothe the naked when we see them, not turn our back on our own”, the Pope noted that currently there is much discussion around whether or not to give shelter to those who ask for it. “Does my fast help others? If it does not it's fake, it's inconsistent and it takes you on the path to a double life, pretending to be a just Christian - like the Pharisees or the Sadducees” he said. Let us ask for the grace of consistency he concluded:” if I am unable to do something, I will not do it. I will do only what I can with the consistency of a true Christian.